My visit to India coincided with the opening of the latest of the 345 odd stores that KFC has in India in Warangal, Telangana. The signs were in Telugu, a brilliant marketing move. The menu is very customized to local tastes and I found the rice Bowlz very interesting. We felt like a snack and my son chose the Popcorn Chicken which was nice, The whole restaurant operation was spotlessly executed and the whole experience was as good as any KFC restaurant in the world. Yum Brands chose well. Warangal is about 150 miles from Hyderabad and is the second biggest state of the newly formed state Telangana. It has a population of 7 million and has the high literacy of 84%. It has a NIT ( National Institue of Technology) a preimier educational institution and well connected by rail. Instead of being a elite high priced restaurant chain, KFC strategy seems to be to follow the "bottom of the pyramid" and become a mass amrket fast food restaurant. According to the KFC India website "It is predicted that India will have the largest consuming class in the world by 2030." and i wish them success. "Yum! 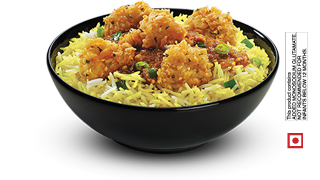 Brands has been in India for more than 10 years and is the largest and fastest growing restaurant company in the country. At the end of 2011, we separated our India business to create a standalone reporting division to underscore the potential scale of this exciting emerging market. "